ARS scientists are developing new tests and vaccines that are making it easier to detect viruses in chickens and protect them from the cancer-like diseases some of them cause. New testsand vaccines are making it easier to detect viruses in chickens and protect them from the cancer-like diseases some of them cause. Results of both the vaccine and modified PCR studies were published in Avian Diseases in 2013.—By Sandra Avant, Agricultural Research Service Information Staff. 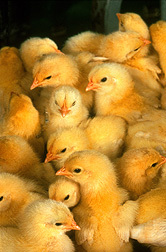 This research is part of Animal Health, an ARS national program (#103) described at www.nps.ars.usda.gov. Aly Fadly is with the USDA-ARS Avian Disease and Oncology Laboratory, 4279 East Mt. Hope Rd., Lansing, MI 48823-5338; (517) 337-6829. "Developing Tools To Fight Marek’s Disease" was published in the August 2014 issue of Agricultural Research magazine.